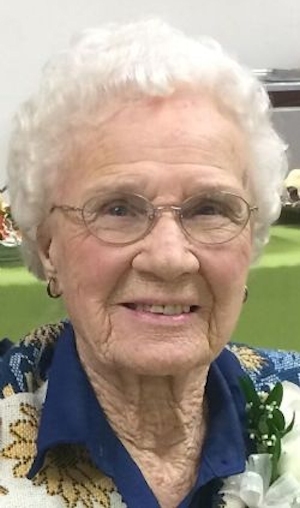 Obituary – Yarborough, Marcella Faye (Nelson) « Perry High School Alumni Association, Inc.
Marcella F. Yarborough, 101, of Perry, OK was the daughter of Benjamin E. Nelson and Idena Catherine (Strom) Nelson. Marcella was born on their family farm southwest of Perry, OK on October 3, 1914, and she passed away on February 18, 2016 in Perry Memorial Hospital. Marcella graduated from Perry High School in 1931 and immediately enrolled in Oklahoma A&M College. She was certified to teach after three semesters of college. For several years she taught school and attended college in the summer. On October 31, 1936 she married Joel E. Yarborough III in Winfield, KS. After the Pearl Harbor attack, Joel was called to active military duty. Marcella and their daughter Jean returned to Stillwater until she graduated from the College in July, 1942. She taught school in Orlando, OK until Joel returned from overseas. She and Joel made their home in Enid for 44 years. There she raised her two children and was an active helper in her husband’s drilling company and flight school. After returning to Perry in 1989, Marcella became very active in the First United Methodist Church serving in UMW, the Quilters Club and maintaining a garden at the church. In addition she enjoyed the Petunias Garden Club, the Progress club and volunteering at Cherokee Museum. Funeral Services will be held at 2:00 p.m. Saturday, February 27, 2016 in the First United Methodist Church with Rev. Michael Strange officiating. Interment will follow in the Grace Hill Cemetery in Perry. Services are under the direction of Brown Dugger Funeral Home of Perry. The family has asked that memorial contributions be made to the First United Methodist Church Quilters Club in care of Brown Dugger Funeral Home 1010 N. 7th Perry, OK 73077 or directly to the church at PO Box 206, Perry, OK 73077. During her declining years, several wonderful caregivers enabled her to remain in her home on Fir Street in Perry. The family expresses their sincere gratitude to Peggy Crispin, Judy Winters, Heidi Neiman, Debbie Sadler and Mindy Nyugen. Survivors include: 1 daughter: Jean Ann Hartsuck and husband Dr. James of Oklahoma City, OK 5 Grandchildren: Rebecca Hulsey of Oklahoma City, OK, Dr. Mary Fleischli of Dallas, TX, Katie Kastner of Austin, TX, Ben Yarborough of Dallas, TX and Betsy Brown of Massachusetts and 16 great grandchildren. She was preceded in death by her parents, husband Joel in 2005 and son Joel Yarborough IV in 2000.